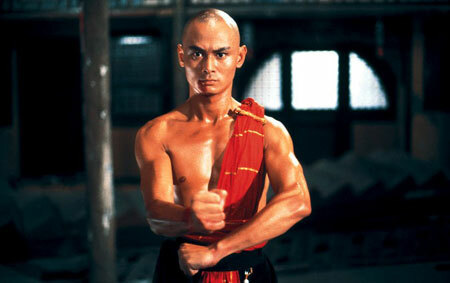 Gordon Liu without his pole in The Eight Diagram Pole Fighter. The Skinny: After his father and brothers are brutally killed, one of the few surviving members of the Yang family takes refuge in a Buddhist monastery, honing his kung fu skills to one day get revenge. Despite a troubled production that endured the tragic loss of a major star, this Lau Kar-Leung directed picture emerged as yet another kung fu classic in the Shaw Brothers library. When twenty-eight-year old Alexander Fu Sheng died in a car accident, his project at the time, the Shaw Brothers film Eight-Diagram Pole Fighter, was thrown into disarray. Few films could survive such a substantial loss, but the finished product, helmed by legendary director Lau Kar-Leung, bears no significant traces marking the difference between the initial concept and the final, retooled version. Perhaps even more surprising is that fact that Eight-Diagram Pole Fighter emerges as not just a good martial arts movie, but one of the top films in the Shaw library. Also known as Invincible Pole Fighter in its English dubbed variant, this 1983 film captures the viewer’s attention from the very beginning, as it shifts from the introduction of an eerie prophecy to a scene of betrayal to the Battle of Jinsha, a delightfully surreal action sequence that was unquestionably filmed on a barebones Shaw Brothers soundstage. During this sequence, we meet the Yang family, a group of seven brothers who, along with their father, occasionally come to the defense of the Sung Dynasty emperor. Unfortunately, the loyalist Yangs are betrayed by Pan Mei (Ke Ming), a royal traitor in cahoots with the invading Tartar (read: Mongol) forces. An epic massacre ensues in which all of the valiant Yangs perish, save for three of the brothers. While the fourth brother, Yang Si-Lang (Hsiao Ho), finds himself taken prisoner by the Tartars and promptly disappears from the narrative, the sixth brother, Yang Liu-Lang (Alexander Fu Sheng) is able to return home to report the bad news to the Yang Matriarch (Lily Li) and his two sisters, Yang Ba-Mei (the great Kara Hui Ying-Hung) and Yang Jiu-Mei (Yeung Jing-Jing). The only drawback is that the bloodbath has driven Liu-Lang completely insane. Little do they know that the last of the three surviving siblings, fifth brother Yang Wu-Lang (Gordon Liu), escaped and fled to the countryside, where he is eventually assisted by a kindly hunter. Director Lau Kar-Leung shows off some nifty fighting skills in his brief cameo as the hunter, as the ensuing fight at the man’s hovel serves as an obvious antecedent to a similar, teahouse-set confrontation in Drunken Master II (also directed by Lau before he left the project in a swirl of “creative differences” with star Jackie Chan). Seeking refuge at a Shaolin monastery, Wu-Lang has a tough time winning over the monks, especially the wizened Abbot (Philip Ko Fei), who believes Wu-Lang’s vengeful, hate-filled demeanor isn’t model behavior for a potential Buddhist monk. Nevertheless, Wu-Lang insists on becoming a disciple, even shaving and branding his own head to demonstrate his seriousness. The monks eventually agree to take Wu-Lang in, but they refuse to train him. In his spare time, Wu-Lang perfects his skill with a staff, the Yang family weapon of choice. The plot kicks into overdrive when Pan Mei and the Mongol hordes (led by consummate Shaw baddie Johnny Wang Lung-Wei) decide to take Wu-Lang’s sister hostage, luring our hero out into the open. Even with the odds stacked against him, Wu-Lang has no choice but to fight them all alone. Will the monks choose to help him? Or will they abstain on the grounds of pacifism? The interwoven contemplation of Buddhist ethics gives the film a thematic hook that goes beyond the typical “tragedy, training, revenge” plot mechanics that typify so many of these films. During Wu-Lang’s stay at the Shaolin temple, the nearby lands come under attack by a pack of wolves. Wu-Lang suggests that they kill the animals, suggesting that any other method will only result in the wolves returning. The monks admonish their headstrong new tenant, as they have been practicing a fighting technique that will defang, but not kill these hairy predators. This extended debate operates as a thinly-veiled metaphor for the monks’ position with the outside world. Should they kill (or at least stop) the “wolves” of humanity who prey on the innocent or should they simply stand idly by on ethical grounds? At the risk of a mild spoiler, I’m guessing you’ll be mighty impressed with how effective that defanging technique can be when applied to the wolves’ human counterparts.